Roger Federer, pictured here with a friend, is a fan favorite at the US Open. * The U.S. Open (aka The Most Wonderful Time of the Year) begins on Monday in New York. Find dining hot spots near the Billie Jean King National Tennis Center with these picks from the Tennis Channel. * Dine Tampa Bay is on. Enjoy special three-course $25, $35, and $45 dinners through August 30. * Washington, D.C. Restaurant Week is extended. Snap up $20.13 lunches + $35.13 dinners through September 1. * Bet on Las Vegas Restaurant Week. Book now for $20.13 or $30.13 lunches and $30.13, $40.13 or $50.13 dinners, August 23-30. * Devour Downtown Indianapolis has kicked off. Enjoy special 3-course, prix-fixe meals through September 1. * Dining out in the Big Easy is even easier with COOLINARY New Orleans. Enjoy 2 or 3-course lunches for $20 or less and 3-course dinners for $35 or less through August 31. * Houston Restaurant Weeks continue! Enjoy $20 + $35 brunches, $20 lunches, and $35 + $45 dinners through September 2. * Spice up your summer with Miami Spice. Order up special $19 or $23 lunches and $33 or $39 dinners through September 30. * Visit Orlando’s Magical Dining Month starts in September. Save with $33 dinners throughout the month. * Flavor Palm Beach Restaurant Month begins September 1. Book for $20 lunches & $30 and $35 dinners through September 30. 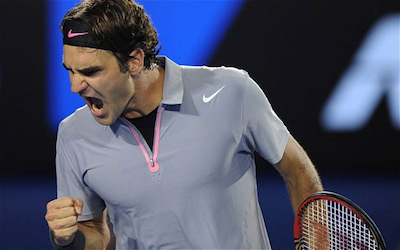 As always, I will be rooting for Roger Federer. Allez! The 2013 US Open Tennis Championships start today in New York. If you’re heading to the USTA Billie Jean King National Tennis Center during the next two weeks, as I am, you’ll likely work up an appetite. Fortunately, the folks at The Tennis Channel have put together a US Open dining guide for the competition. Click here to find a restaurant to match your appetite. * OpenTable has released the OpenTable Restaurant Industry Index for Q2 2013. Find out how restaurants in major cities across the U.S. have been performing. * Just two more days of Costa Mesa Restaurant Week. Reserve today for up to 40% off on gourmet meals at Costa Mesa’s best eateries, through August 23. * Baltimore County Restaurant Week heats up! Get charmed by $15.13-$30.13 lunches and $15.13-$35.13 dinners through August 25. * Downtown Cincinnati Restaurant Week continues. Take advantage of $35 dinners for one or two through August 25. * Downtown Raleigh Restaurant Week ends soon. Book now for $20 or $30 three-course dinners, and $10 beer or wine pairings at select locations, through August 25. * Washington, D.C. Restaurant Week has arrived. Snap up $20.13 lunches + $35.13 dinners through August 25. * Bet on Las Vegas Restaurant Week beginning tomorrow. Book now for $20.13 or $30.13 lunches and $30.13, $40.13 or $50.13 dinners, August 23-30. Dining Poll: Which US Open Player Is Your Dream Dinner Date? We’re celebrating the start of the US Open and our exclusive Tennis Channel-OpenTable US Open Dining Guide! If you follow this blog, you may know that I am obsessed with a big fan of Roger Federer, who always makes time to dine at some of the Big Apple’s best restaurants when he’s in town. So, obviously, you know that I would love to get an OpenTable invite from him! With which top contender at the US Open would you most like to share a meal? Weigh in on today’s tennis-centric poll! Which top-seeded US Open player would you love to dine with?